This is a reprint of A Review of the Best Apocalypse Ever that was published May 20, 2011 and was essentially a review of The Underfold's (a webcomic at theunderfold.com) first collection Best Apocalypse Ever. Thursday Comics will return next week with new material. 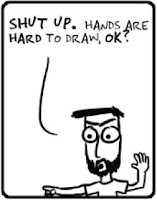 The Underfold, which sounds like some sort of skin flap located around the perineum, had it's humble beginnings as drawings on index cards at a church in 2008 and since then it is becoming a web comic known around the world. 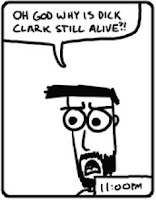 Best Apocalypse Ever is a collection of Underfold strips showcasing early strips and the Zombie Apocalypse of 2010. One of the more interesting things about collections like this is the evolution of the strip. Admit it, it is interesting to see how Calvin and Hobbes evolved from more cartoon-y drawings into a beautifully watercolored work of art of its later years or how Charlie Brown transformed from a wide eyed kid with a big head to a slightly chubby boy and into the version we know now. 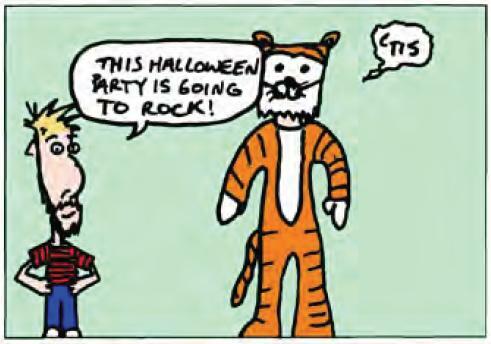 It's not quite Calvin and Hobbes but you can hardly tell the difference. I'm hoping this is a homage to Knightfall. The relationship between Brian and JB remind me of the relationship between me and my best friend. We get along good but it's kind of a hassle to be each others friend and there is a slight possibility that we hate each other and talk bad about each other behind each others backs. A prime example is when JB is talking with Fred and Fred asks how JB can stand Brian because "he just keeps talking and talking [...] It's horrible!" which is a phrase I'm sure I've used explaining my friend to my wife. And we all know the best thing about books, movies and TV shows is when we see a little bit of ourselves in the characters. A little more than halfway through the book, Brian and JB begin bouncing through various times and dimensions including a world drawn in crayon, CBS's The Amazing Race and a dimension where birds are the dominant species and humans fly. 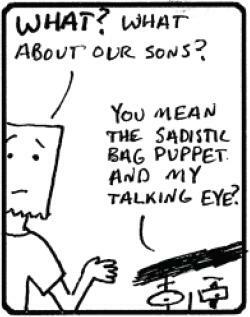 And then the comic starts to get weird. 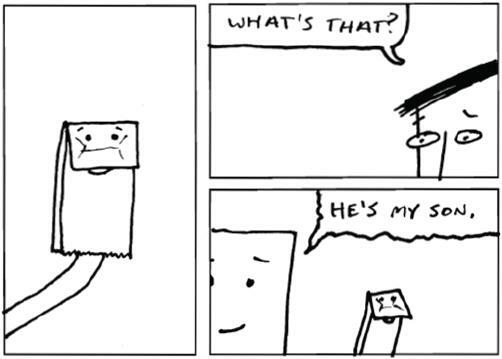 Brian's goatee comes to life and JB gets irritated with the storyline so he resets the strip. *Cough* After the reset, life returns to normal for Brian, JB, Fred and Eye. At least normal for the Underfold. Eye breaks the fourth wall. The four-panel strips are my favorite. 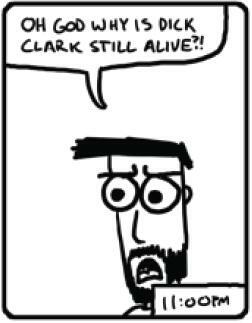 I am a sucker for standard comic strip joke-a-day formats. It harkens back to a bygone era where four-panel newspaper comic strips were actually funny and not the watered down dreck currently permeating people's retinas. The Zombie Apocalypse comes and goes, we got an homage to the Terminator series of movies and then a murderous robot assassin attempts to kill Baby Jesus which is something I wrote about several years ago. So it's clear that at some point in 1993, Brian Russell rifled through my trash and stole my idea. My attorney, Lionel Hutz, is looking into it. The art is simplistic but it is better than anything that I could do. 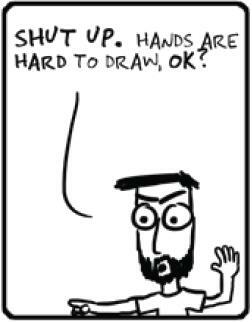 Each character is drawn uniquely and are more than expressive enough. Even JB and he has a bag over his head. The character to really grab my attention was, of course, Eye. Eye, who is an eye with arms and legs, always speaks in the third person, replacing word like "I'm" and "I'll" with "Eye'm" and "Eye'll". It makes perfect sense if you don't think about it too long which is the way to really understand The Underfold. Brian says in the book that he is bad at endings and wrapping things up but if you don't think about it then everything makes perfect sense. 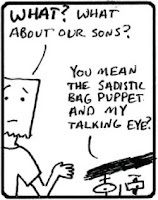 Sadistic Bag Puppet sounds like another web comic. The book ends on Christmas 2010. There is something for everyone in this book. At least everyone if you are under the age 35. Let's face it, older people don't understand things like this. Only the really cool or really perverted ones do. But after you have ordered your copy of The Underfold, you need to head over to theunderfold.com and get caught up and find comics that were not included in the book. It's the only right thing to do. And when the real Zombie Apocalypse happens, you don't want Brian to hand you over to the zombies because he found out you don't read his comic do you?